In a dead flat calm the horizon is almost indistinguishable. In a dead flat calm the water is serenely beautiful. The line that marks the horizon is too faint to mean anything. 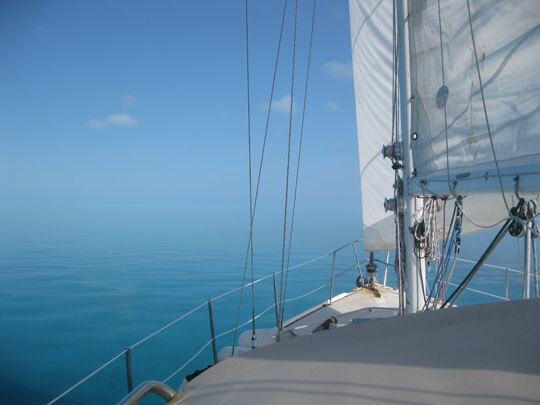 The sea, reflecting the azure color of the sky, seems to just rise up and above the boat, enveloping you in a boundless sphere. With the boat motor turned off the quiet is only broken by the sound of your own voice as you drift in the blue ball. Looking off into the distance you search for ripples in the water, a gust of wind, so you can keep the motor off and still be propelled forward. It is a slow ride in a surreal paradise. We were the first ones out of the anchorage Sunday morning. Our goal was Hatchet Bay, where we would spend a few days before heading back across the bight of Eleuthera, through the Current Cut to Royal Island and up through the Atlantic Ocean to Abaco. There was little wind. Nothing was bossing the water around this day. We motored mostly, asked each other Trivial Pursuit questions, and arrived at Hatchet Bay early evening. 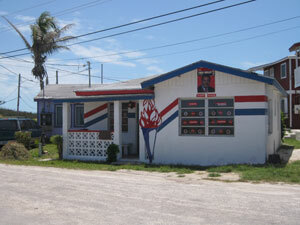 This picture of the headquarters for the Progressive Liberal Party was taken on our previous visit to Alice Town. On election day this porch was packed with supporters in yellow shirts. Monday was Election Day in the Bahamas. Schools were closed and many businesses closed early. Bahamians are very passionate about their elections. They approach them with the kind of enthusiasm that Americans reserve for football games. There are parades and rallies. People fly flags for the party they support attached to the roof of their vehicles. Some of the most zealous supporters may have as many as a dozen or more flags adorning the roof of their cars. 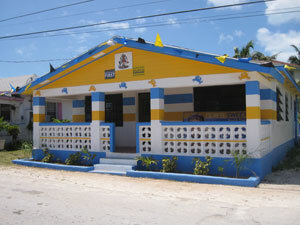 The village on Hatchet Bay, Alice Town, is home to headquarters for each of the two major political parties, painted in each partyâ€™s distinctive colors â€“ red and blue for the FNM and yellow and a purplish blue for the PLP. In the afternoon, as we walked though town, people were gathered at these party headquarters gearing up for barbeques. Almost everyone we saw was wearing either yellow (for the PLP) or red (for the FNM) t-shirts. People were friendly, but seemed a little reserved. Despite all of the parades, parties and revelry leading up to the election, the actual day seemed quite serious. Headquarters for the Free National Movement on a nonelection day. On election day it was overflowing with supporters in red t-shirts. We had dinner on Blue Wing, then headed back into town after the polls closed at 6pm and our favorite watering hole, Da Spot, opened. Election results were being broadcast on the televisions. The jovial atmosphere we experienced during our first visit to Da Spot was replaced by rapt attention to the TVs. We watched for a while, not really understanding the implications of any of the results then returned to the boat. About 10 or 11 pm we heard the sounds of a party in the streets. Winners had been declared. The next day I checked the results on the Internet. It appeared the PLP were the winners and the new ruling party. Not understanding Bahamian politics or the real differences between the political parties, I have no idea what significance this will have for the Bahamian people. But I hope this new government brings them peace, prosperity, health and unity. To be honest, though, I think governments anywhere rarely bring any of that. The best we can do is slow down and enjoy the dead flat calms, weather the storms, and try to keep a true course though unpredictable waters. 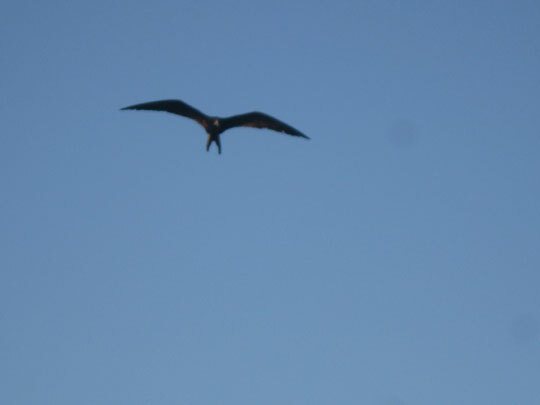 An Magnificent Frigatebird. I have seen lots of these in the Abacos, but they never fly close enough to the water to get a decent picture of.